The Bipartisan Budget Act of 2015 (“Act”) made significant changes to the Internal Revenue Service’s partnership audit rules effective for partnership tax years beginning in 2018. How the new audit rules will affect a partnership and its partners will depend, in large part, on choices the partnership, the partnership representative, and/or the partners make or fail to make. The changes are expected to dramatically increase the audit rates for partnerships and will require partners to carefully review, if not revise, their partnership’s operating agreement. Careful planning today will help mitigate any unfavorable consequence. partners (the tax could be collected at the highest individual tax rate). • Current partners could be responsible for tax liabilities of prior partners. • New elections and opt-outs will be available and your agreement may need revision to specify who makes these decisions. • There are many new tax terms and concepts that will likely require you to adjust your partnership’s operating agreement. Under the new rules, the designated partnership representative has the “sole and exclusive authority” to act on behalf of the partnership and to bind all partners with respect to partnership matters subject to the partnership audit rules. This authority includes, but is not limited to, making relevant elections, representing the partnership during an audit, negotiating and agreeing (or disagreeing) to settle with the IRS, and seeking judicial review of an IRS adjustment. In the absence of an appointed person, the IRS has the discretion to pick a partnership representative; therefore, partnership and LLC agreements should be revised to specify who will act as the partnership representative. Small partnerships (100 or fewer eligible partners) may choose to “opt out” of the new partnership audit rules by making an annual election on a timely filed Form 1065 for the applicable tax year. The option to “opt out” of a partnership level audit is not available to any partnership that has trusts or partnerships (including LLCs taxed as partnerships) as partners. Another option, the “push out” election, is available to partnerships once a notice of final partnership adjustment is issued. The partnership would need to make a timely election within 45 days of receiving a notice of final partnership adjustment to “push out” the assessment to the individuals that were partners during the audited tax year. This election comes at a cost. The rate of interest assessed on underpaid taxes rises two percentage points if this election is utilized; however, the increased interest rate may be acceptable if the current ownership is different than the year audited. Under the options detailed above, the partnership would pass through the tax adjustment to the persons who were partners during the audited tax year by issuing amended Schedules K-1. Each partner receiving an amended Schedule K-1 would be required to amend their returns for the audited tax year. agreement including all amendments, thereto. Please call us if you would like to discuss these new partnership changes and review your planning opportunities. We are now open in our new South Reno location, just south of the Kietzke Lane and Neil Road roundabout. If you are in the area, please stop by to say hello! Using appreciated stock held over a year to fund a significant contribution to a public charity instead of cash can result in a “double play”. You can get the benefit of a deduction equal to the full fair market value of the shares and at the same time avoid paying capital gains tax on the appreciation. Making a charitable contribution using publicly traded stock is fairly simple. For contributions of more than $5,000, you must attach Form 8283 with a description of the shares contributed, their fair market value, how you acquired the shares and your cost basis. In addition, as is true for all contributions over $250, you must obtain written contemporaneous acknowledgement of your contribution from the charity, which must include a statement that you did not receive anything of value in return for making the contribution. The same result can be attained with a charitable contribution of non-publicly traded shares. However, for gifts valued at more than $10,000, there is an additional requirement. In order to secure a deduction, you must get a “qualified appraisal”. A qualified appraisal is a complex and detailed document, which must be prepared and signed by a “qualified appraiser”. While it generally does not have to be attached to your tax return, the appraisal must be obtained before the due date, including extensions, for filing your income tax return on which the deduction is claimed. We are often asked about charitable contributions involving non-publicly traded stock and business interests, where the appraisal requirement seems redundant and completely unnecessary. Consider a contribution of an interest in a partnership whose units are freely exchangeable for shares of publicly-traded stock; or, a contribution of shares in a corporation whose shareholders are subject to a “buy-sell” agreement, which clearly sets the value of the shares; or, a contribution of shares in a closely-held corporation whose shares have traded in many arms-length transactions during the year. Unfortunately, even when an appraisal is redundant, the Code and Regulations strictly require that you get an appraisal. What if you have made a significant charitable contribution of appreciated non-marketable securities in 2016 and you have not yet obtained a qualified appraisal? You should consider requesting an extension to file your 2016 income tax return before the April 18, 2017 deadline, so you have until October 15 to get your qualified appraisal. No appraisal means no deduction, or at best, your deduction will be limited to your cost basis instead of the fair market value. CONSULT YOUR TAX ADVISER — this article contains general information about various tax matters. You should consult your CPA regarding the implications to your own particular situation. George Ashley is a shareholder in Ashley Quinn, CPAs and Consultants, Ltd., with offices in Incline Village and Reno. He may be reached at 775-831-7288, and welcomes comments at GAshley@ashleyquinncpas.com. We’ve been preaching that note for decades – but some folk just don’t seem to get it, and refuse to look after their own savings needs, expecting they will be spending each summer on the Riviera. It just doesn’t work that way. IRS Commish Heading For Early Retirement? Seems as if that’s pretty much how it’s looking – the House Judiciary Committee has scheduled hearings to examine alleged misconduct by Commish Koskinen, we hear. On May 24 (just next week) the Judiciary Committee will hear the findings of the House Oversight and Government Reform Committee’s investigation of the Chief Revenooer! Tax Freedom, that is! You actually just achieved it about a week ago, according to the Tax Foundation. “Tax Freedom Day” 2016 just passed – on April 24, or 114 days (not counting “Leap Day”) into the new year. And indeed, “Freedom” comes one day earlier than last year! IRS: No Deduction For Spiffy Duds! So you think the fact that you spend some big bucks on the clothes you wear to work – in order to impress your customers and others – is reason enough to have Uncle Sam subsidize your expenditure. Always vigilant to the endless raft of tax shenanigans going on out there, IRS has released its latest list of favorites – warning taxpayers to be alert to the most egregious potential problems lurking. Identity theft – This is the biggie. IRS continues to hunt down and prosecute the crooks filing false tax returns using other folks’ social security numbers to secure refunds to which the bad guys are not entitled. Phone scams – We’ve even received one of these – a call from a bad guy impersonating a real Revenooer claiming that unless we pay (a phony “unpaid tax” amount) arrest and other bad things awaits us. Phishing – Though IRS never communicates with taxpayers about unpaid balances, the bad guys do, in an effort to steal personal information. IRS warns you to be wary of strange emails and websites that are likely nothing more than invitations which, if accepted, will expose your personal information to theft. Return preparer fraud – Deal with reputable professionals only, and beware of preparers, for example, who may pop up with a store front near you, promising all kinds of tax goodies if you engage them. Offshore tax avoidance – IRS has gotten pretty good at nipping this one in the bud, but some folks still think they can hide assets and/or income abroad, keeping IRS at bay. This can be really bad medicine and folks who play this game will find their pocket book much lighter if/when IRS catches up, not to mention the possibility of a stay in the slammer. Inflated refund claims – Stay away from any preparer who asks you to sign a blank return, promises a big refund before even reviewing your records, or charges fees based on a percentage of your refund! Fake charities – Make sure your donations go to only legit charities and not ones with “sound alike” names to those we all know and love. If in doubt, check with IRS first (www.irs.gov) who keeps a list of all charities which are truly tax exempt organizations. Excessive claims for business credits – The fuel tax credit and research credit are high on IRS list of those credits which often are used by cheaters. Falsifying income to claim credits – IRS warns you not to “invent” income so you can incorrectly qualify for such items as the earned income tax credit! Abusive tax shelters – This one, too, used to be of more concern to IRS, which has become pretty good at shutting down these tax avoidance schemes, and even putting some of the folks pushing them in the clink. If a peddler tries to sell you on one of these, and it “sounds too good to be true,” the likelihood is that it is. Comforting, isn’t it? To learn that IRS has adopted policies that prohibit its employees who cheat on their own taxes to work for Uncle Sam! “I have no indication that anyone working for the IRS has not followed the updated procedures,” quoth Commish Koskinen in recent testimony before the Senate Finance Committee. Seems like an issue which just won’t go away – the question of whether a worker bee is an employee, or an independent contractor. Makes a big difference in how the bloke reports his expenses. If he’s an employee, those expenses go on Schedule A as itemized deductions, and are likely to be subjected to some limitations in the deductible total. If he’s a contractor, the expenses go on his Schedule C, and further any net profit he reports there can qualify him for retirement plan deductible contributions as well. Seems the Revenooers plan to go silent – they just don’t want to talk to you anymore. The National Taxpayer Advocate, in her recent report to Congress, notes that for the past year and a half, IRS has devoted significant resources to creating a “future state” plan which details how the agency will operate in five years. The plan is explained and developed in a document known as a Concept of Operations (CONOPS). But CONOPS gives the Advocate a bit of heartburn – implicit in the plan (and explicit in internal discussion) is an intention of the part of the Revenooers to substantially reduce telephone and face-to-face interaction with taxpayers. IRS is hoping that taxpayer interactions with IRS through online accounts will address a high percentage of taxpayer needs. Taxpayers place more than 100 million telephone calls to IRS each year and have done so in every year since fiscal year 2008. Taxpayers make more than five million visits to IRS walk-in sites each year. Taxpayers send an average of about ten million pieces of correspondence to IRS in response to proposed adjustment notices each year, to which IRS must respond. Who knows – maybe this is a good thing. And the latest from Hillary, this week: a proposed 4 percent ‘fair share surcharge’ tax on the wealthy – now defined as folks making more than $5 million per year. “This surcharge is a direct way to ensure that effective rates rise for taxpayers who are avoiding paying their fair share, and that the richest Americans pay an effective rate higher than middle-class families,” says a Clinton aide. We’d call this a “broken record” argument, but who knows what vinyl is any more. Jeff Quinn, the author of this article is a CPA recently retired from the firm of Ashley Quinn, CPAs and Consultants, Ltd., with offices in Incline Village and Reno. He welcomes comments at jquinn@ashleyquinncpas.com. So, here we go – head first into another election year! And you Hillary fans, out there, should not forget her recent promise to go even beyond Obama’s desired tax schemes, and “to make sure the effective tax rate paid by millionaires reflects a truly fair tax system,” according to one of her aide’s recently. Recall that Obama, once upon a time, propounded the so-called “Buffett Rule” (named for his buddy, Warren Buffett, billionaire investor.) Obama thinks taxpayers with adjusted gross incomes exceeding $2 million should pay a minimum tax rate of 30% – vastly higher than the rate applicable to various forms of investment income presently taxed at a top rate of 23.8%. Unstated by Dougie: those are also the folks who take the risks and invest the capital which fuels growth and provides jobs, whom he and Hillary would propose to punish. And isn’t it time somebody stood up to the morons pleading for abolition of the IRS? We hold the Revenooers in as low esteem as anybody, but let’s get real. Even National Taxpayer Advocate Nina Olson, in recently suggesting that IRS could, indeed, be smaller, points out the notion that the agency could be abolished is basically impractical. Not to mention someone to administer the system’s complex laws and regulations. 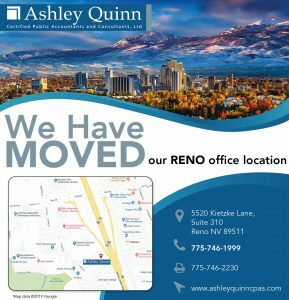 Jeff Quinn, the author of this article, is retired from the firm of Ashley Quinn, CPAs and Consultants, Ltd., with offices in Incline Village and Reno. He welcomes comments at jquinn@ashleyquinncpas.com. We’ve reported, many times, about various situations in which beleaguered taxpayers have been unable to meet the requisite 60 day IRA rollover rule (to avoid treating the dough coming out of the IRA in the first instance to be taxable), and IRS has bent over – showing its “kinder and gentler” side and not slapping the taxpayer with penalties. Most of these cases have fact patterns indicating the delinquency was not the taxpayer’s fault, but often times that of the IRA custodian because of that guy’s administrative delays. But in a recent private letter ruling, IRS refused to waive the 60 day rollover requirement for a taxpayer whose attempt to use an IRA distribution to buy an interest in a partnership failed because the IRA custodian couldn’t hold the interest – a mistake that the taxpayer did not learn of for almost a year. In response to the taxpayer’s plea that the timeliness failure was due to his receipt of incorrect advice, IRS hung tough on the notion that the failure was in fact due to his decision to use IRA proceeds to fund a business venture. IRS will consider several factors in determining whether to waive the 60 day rollover requirement, including time elapsed since the distribution, inability to complete the rollover due to death, disability, hospitalization, incarceration, restrictions imposed by a foreign country, postal error, errors committed by a financial institutions, etc. In this case, the taxpayer’s financial advisor prepared the paperwork for the taxpayer to sign, and on November 21, 2012, the custodian issued a check payable to the partnership. The taxpayer intended that his IRA purchase the shares, and that they be held by the custodian. But as it turned out, due to some technicality in the partnership agreement, the custodian was eventually unable to hold the investment on behalf of the IRA. The taxpayer believed that the financial advisor should have prepared paperwork to transfer the amount to a financial institution that could have held the partnership interest on behalf of the IRA. The problem was not discovered until October of 2013 – obviously well beyond the 60 day rollover period. Right or wrong, IRS conclusion, here, was that taxpayer’s failure to complete a timely rollover wasn’t due to any of the factors described above which have been held in the past to constitute valid excuses, but instead was due to his choice to use the IRA proceeds to fund a business venture. Result: taxpayer is forced to include the distribution in his taxable income for 2012. And did you hear the latest from Hillary’s campaign re her tax proposals? $250 billion in direct “investment” over the next five years. Plus an additional $25 billion to fund a “national infrastructure bank.” None of this dough comes from the “middle class,” of course, whose taxes Hillary would “cut.” Hillary wants to give those folk “a raise,” while she hits the top 3% of earners to pay for all of this largesse. Heard that one before? How much is enough? Revenooers Comin’ After High Earners! And the Treasury Inspector General for Tax Administration (TIGTA) doesn’t like the IRS’ “MO”. In its most recent audit report, last week, TIGTA notes that IRS has taken steps to improve its audit coverage of high-income taxpayers. But it should reevaluate whether the threshold of $200,000 for its High-Income and High-Wealth strategy results in an efficient allocation of audit resources. TIGTA says that because IRS is devoting more audit resources to these taxpayers, it is important to know at what level of income or wealth taxpayers tend to begin establishing complex financial holdings that are at greater risk for noncompliance with the law. IRS’ High-Income and High-Wealth strategy devotes nearly 50 percent of its high-income audits to taxpayers earning $200,000 to $399,999, whose tax returns potentially present the least productivity of all high-income taxpayers, says TIGTA. “The IRS should reevaluate the income level it uses to identify taxpayers for its High-Income and High-Wealth strategy so that it can better allocate audit resources to the most significant audit risks,” says J. Russell George, TIGTA major domo. The IRS Large Business and International Division (LB&I) established the Global High Wealth (GHW) Industry, which takes a comprehensive approach in auditing high-income taxpayers by extending audits beyond the individual tax return to the entities which these taxpayers control. But IRS is using resources from three other LB&I industries to assist with auditing GHW cases, though no evaluation has been made regarding the impact of that decision on those other industries. Further – and importantly – IRS cannot quantify its GHW audit performance because of limitations of IRS audit information systems, and GHW has not implemented a quality review process for its audits. And you can thank Obama for recently eliminating a process (the “file and suspend method” of claiming Social Security benefits) via recent legislation which will nix this strategy used by married folk to maximize their lifetime benefits. Under this approach, a higher earning spouse would claim benefits at his full retirement age (presently 66) but suspend the benefits until a later date allowing the Social Security credits to continue to grow. The lower earning spouse would then claim benefits based on the higher earning spouse’s earnings record, which would be more than the benefits based on his or her own earnings record. The new rules eliminate this opportunity for claims filed after April 30, 2016.